This is a new classic British bike petrol tap, ( a "reserve" tap which will allow the tank to fully empty), of the lever type with the chromed brass body, as fitted by Triumph, BSA*, Norton and many more in the 1960's and 70's. It will also retro fit to many 1950's models as they are the standard 1/4 BSP fitting as used on most of the post war twins (and many singles and triples). These are now manufactured with a Viton seal which is resistant to the modern unleaded petrol which has a high Ethanol content. 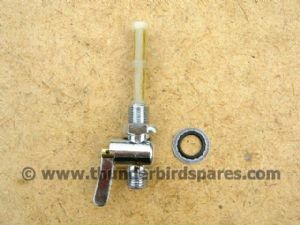 They come with brass (chrome plated) mounting nuts, dowty sealing washers and a fine brass filter mesh. 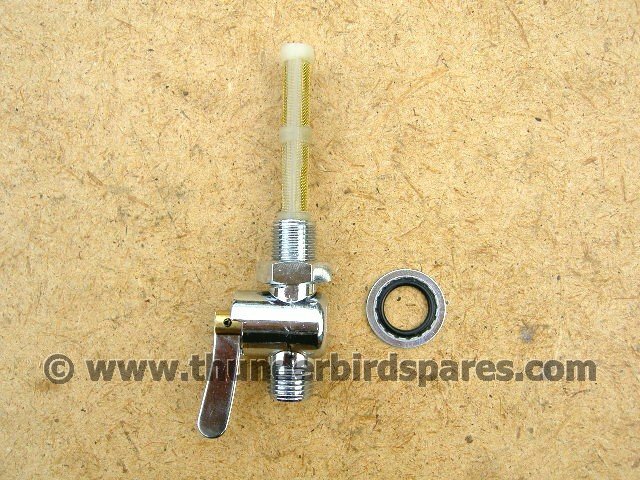 *Please note some BSA models use a larger fitting (3/8 BSP) so you will need an adaptor to fit these taps, we usually have these in stock. Also AMC lightweights usually had a smaller 1/8 BSP fitting so are not suitable for these taps. Please email if you need any info on fitting.